As many times as I've been to Palos Verdes, I can only remember seeing the typical orange and white Bird of Paradise flowers. Flowers are one of my favorite photography subjects, and I had to grab my camera when I noticed a blue and white version of the Strelitzia. 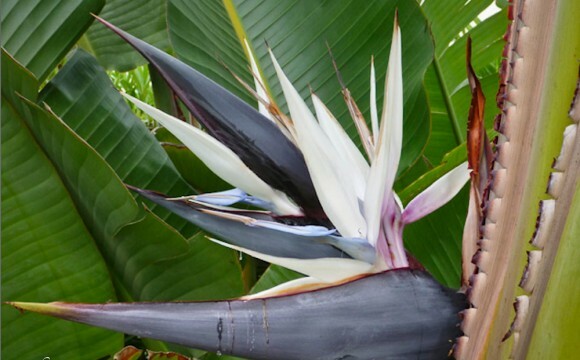 These perennials are native to South Africa, and its common name comes from the supposed resemblance of the flowers of the plant to the bird of paradise. In South Africa, apparently it is known as the crane flower, and is even featured on their 50 cent coin. This stately flower grows from tropical-looking plants have banana-like leaves on them. My mom has never liked these flowers, but I find them beautiful and elegant.